Hooray! We’re extremely happy with our garden project for January! Propagation of Cordyline terminalis by tip cuttings and section cuttings showed 100% success rate! 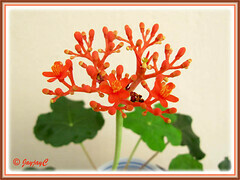 Now, we’ll have more than enough Red Ti Plants to adorn our frontyard and backyard. 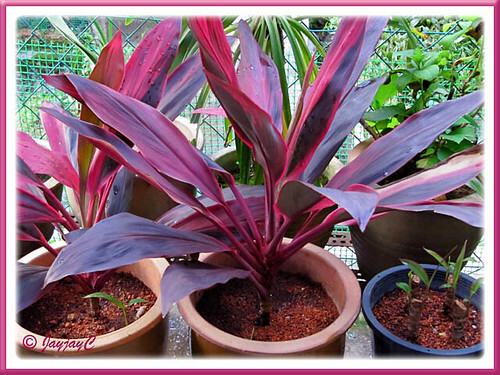 Their beautiful variegated foliage in pink to purplish red will be such a welcome sight for added attraction and will definitely brighten our garden scene…love them! 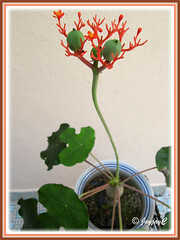 Another plant that decided to smile for us in February is Jatropha podagrica (Gout Plant, Buddha Belly Plant), an 8 cm-tall seedling that was found by the roadside, uprooted and brought home last September 28th. We never expected to enjoy its first flowering so soon…a little over 4 months and to see them developing into fruits as quick too! Hmm…flowering and fruiting occurring within a couple of weeks apart and within the same month, as if impatient to be a mother! Simply fantastic! 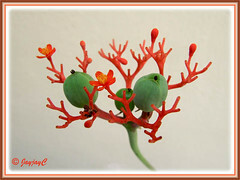 Hope to be able to gather its matured seedpods before they explode to scatter the seeds several meters away as they’re known to be highly dehiscent when ripened to blackish-brown in colour. Got to watch them like a hawk if I desire to capture their seeds for propagation as an experiment! You surely got green fingers for the propagation part. 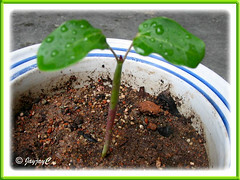 The Buddha belly is truly a feat – to plant them using seeds is really challenging. Thanks, James! Not always successful though. I’ve tried sowing 2 seeds of the Buddha Belly Plant before (got them from our visit to Rimba Ilmu last August) but unsuccessful – I forgot about them and probably would have recycle the potted soil for other plants…lol!! Hope to remember them this time around if I do get those elusive seeds! And will also take note of your advice…thanks! Hi Anna! We’ve never tried propagation by cuttings but as you’ve found out they can be easily and successfully propagated from seeds though. 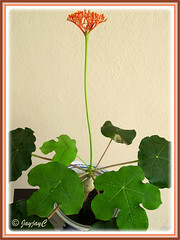 Well done, Jackie, this is the first time I heard of Buddha Belly plant, and it really do look like Buddha’s belly. They are so so beautiful, keep it up. Thanks for visit and kind comments, Rose! I was surprised to see a large shrub, about 6-7 ft tall recently…didn’t know this plant can grow that huge!